TEHRAN, Jan. 22 (Mehr News Agency) -- Late Haj Qorban Soleimani, veteran dotar player from the Khorasan region of Iran once said that French citizens knew him better than his own nation. Soleimani who was in the agricultural business died of pneumonia on Sunday January, 20 at the age of 87. In his last interview with the Mehr News Agency, he had expressed his regret, saying, "Non-Iranian nations especially the French know me better than my fellow countrymen since they have a passion for art and music." 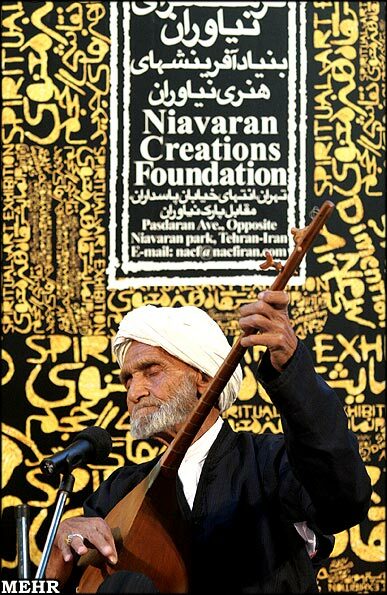 He refrained from saying that Iranians do not like art and music, but he noted that French people had invited him every year to their country to play the dotar for them. Soleimani who gained the high rank of 'Bakhshi' at the age of 21, expressed his regret over the fact that so many of the local people are ignorant of their native regional music and said, "In the Khorasan region 'Bakhshi' is the title given to a musician who is perfect. He must be able to compose, sing, play, make musical instruments and even know stories and narrate tales. One can hardly find any such artists these days." He explained how he had made use of silk for the strings of his dotar in the days before the manufacture of special wire for this purpose. Soleimani had received the honorary title "Real National Treasure" in 1991 in France when he attended the music festival in Avignon. His body was buried on Monday in his birthplace Aliabad. Haj Qorban is survived by 14 children of whom one son Alireza and two daughters have taken up their father's interest in music. Alireza, who is now 50, had been accompanying his father in performances over past years.